More tidying up this morning included righting slipping Granny. 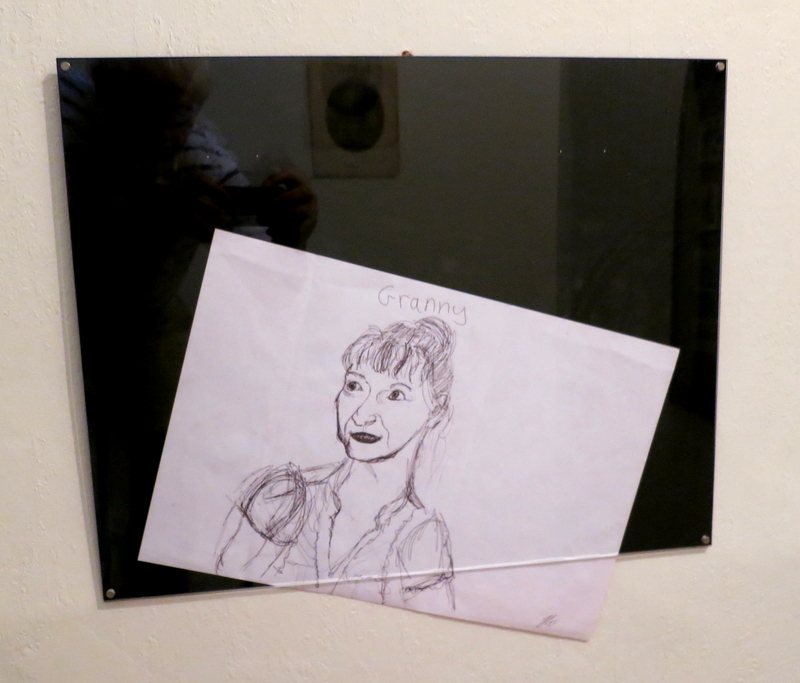 Flo’s portrait of Jackie, made some years ago, when our granddaughter was still quite small, needed a little Blu-tack. This process reminded me that the picture had been created on the back of a noodle bar paper placemat whilst awaiting a meal. I believe Pablo Picasso became quite popular among other waiters for dashing off some of his priceless doodles in a similar manner………. Well, you never know. I went mountaineering this morning in search of a mobile phone signal. I walked up to Monbos and back, but had almost reached the church before I received a viable connection. The aptly named Sigoules Heights development appearing in the middle distance wasn’t high enough, it seems. I even spoke to Jackie for 21 minutes, and only stopped when a shower struck. Someone had kindly left open a shed door to provide me with shelter. 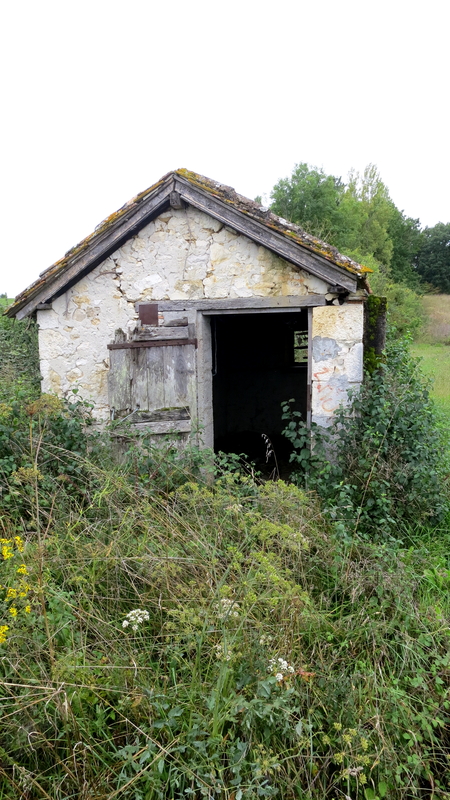 I have passed this derelict building in the middle of nowhere several times in the past five years. Once it contained bedding; another time a motorbike; today just a pile of rubbish. And briefly, me. 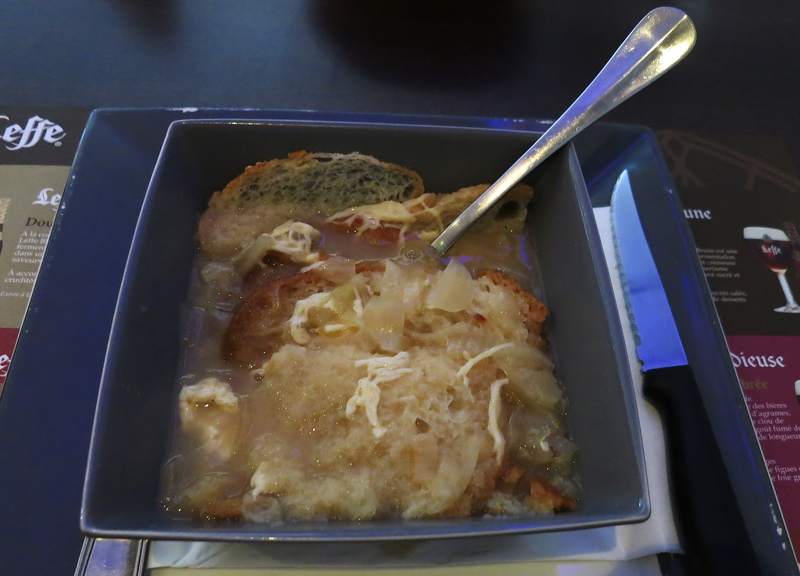 As I blew on my French onion soup that was the Le Code Bar lunch starter today, I pondered on the human breath. I was using it to cool my soup. In colder weather I could have applied it to my hands to warm them. Apart from its main object of keeping us alive we can blow up balloons with it; rekindle fires or extinguish matches with it; whistle with it; and carry out many other activities that you will be able to think of. The soup was followed by enough battered squid rings to have provided lifebelts for the Titanic. As if this weren’t enough, my breath was taken away by the stranded whale on a pebbled beach that filled the platter that followed. This was in reality thick chunks of superbly cooked gammon smothered in a piquant pepper sauce resting in a sublime bed of succulent beans. There was a selection of desserts. Recognising that Max was in a challenging mood, and unwilling to be defeated, I chose profiteroles. The chef marvelled at the speed of my consumption. I was, of course, stoking up for the day. And I didn’t eat all the bread. Back at the house work continued. In particular, the piping as well as the joints under the bath has been renewed. This was omitted by the plumber who attended me after the burst pipes of 2008. For the last hour I had a fascinating conversation with Saufiene; Benoit who is from the deep South; and Sandra who has quite a bit of English, Basque, Spanish, and Russian to go with her native French. My greatest contribution to this was managing to explain to Benoit the joke in the marvellous rude card depending on a French waiter’s English pronunciation which Tess had sent me. The discussion was aided and abetted by Amsterdam, a 7% Dutch beer. Benoit, a man who uses his hands and body to communicate, waxed lyrical about his favourite game, rugby. I was in with a chance with this. Not much. Yesterday afternoon Saufiene visited with his brother-in-law, an humidity expert. He confirmed Saufien’s judgement that an humidifier is need in the cellar and that, fortunately, the water extraction pump just needs a new filter. The humidifier will mediate the inside and outside temperatures. In the evening and through the night a spectacular thunderstorm cleared the air. Somewhat. It is still warm and muggy here. A gentle rustling soon developed into a cascade of stair rods splashing off the garden surfaces; dripping off the bracketed outside light, and every other projection, especially the roof tiles; a deafening clattering on the landing skylight; and a trickling into the fireplace. 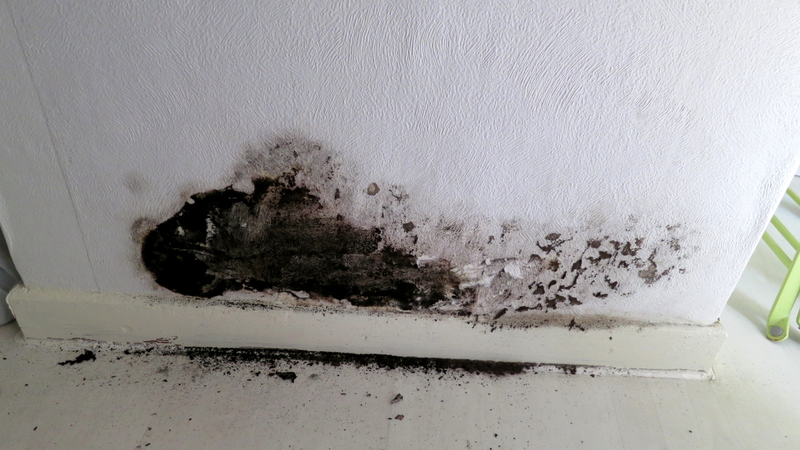 We had established a couple of days ago that the persistent damp patch in the sitting room is the result of there being no cover on the chimney. I have heard that supermarket carrier bags disintegrate after five years, and are thus biodegradable. Shreds of white material at the foot of the bin in the shower room are evidence of this. The bag lining the inside has not been changed since being inserted in 2009, although the contents have, of course, occasionally been decanted. 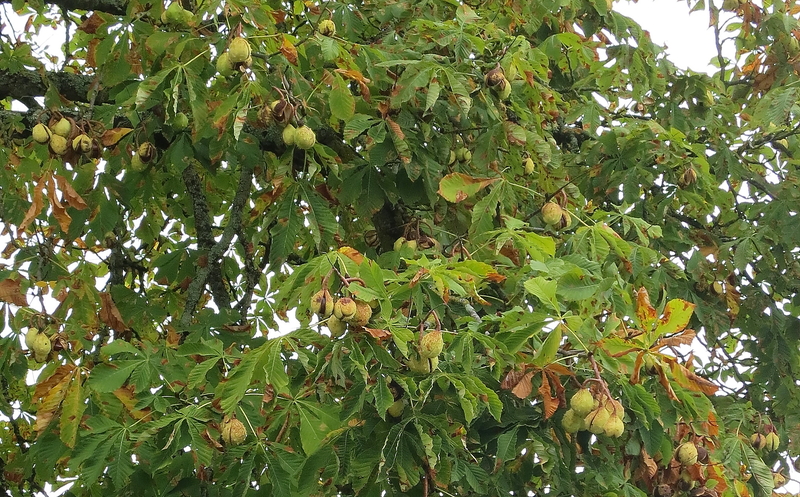 Passing through the empty market square on the way to Carrefour this morning I noticed that the horse chestnut tree was laden with fruit, their shells splitting, soon to release lovely brown conkers to hit the ground beneath. In my childhood, had that tree been on Wimbledon Common, there would have been very few conkers on the tree and empty shells and an array of sticks on the ground. The throwing sticks were taken to the trees by countless boys, including Chris and me, over the years. We would chuck them at the nuts that looked ready to fall, thus aiding their release. Whoever threw the stick that brought some down, a mad dash ensued for the spoils bouncing off the grass. I read some years ago about an English head teacher who had banned the game of conkers from her school playground, on the grounds of Health and Safety. Given that the object was to smash the other child’s conker with yours, and that would result in flying bits; and maybe some children wouldn’t have the sense to keep their knuckles out of the way, I suppose she had a point. But it did rather sadden me. I don’t know what current UK policy is. 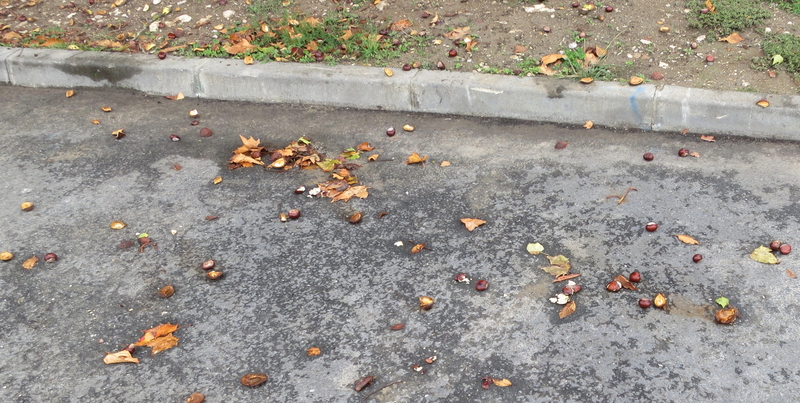 I have never seen French children playing this game, and judging by the number of fallen fruit left to the mercy of the wheels of vehicles in the car park, I suspect they may not know it. 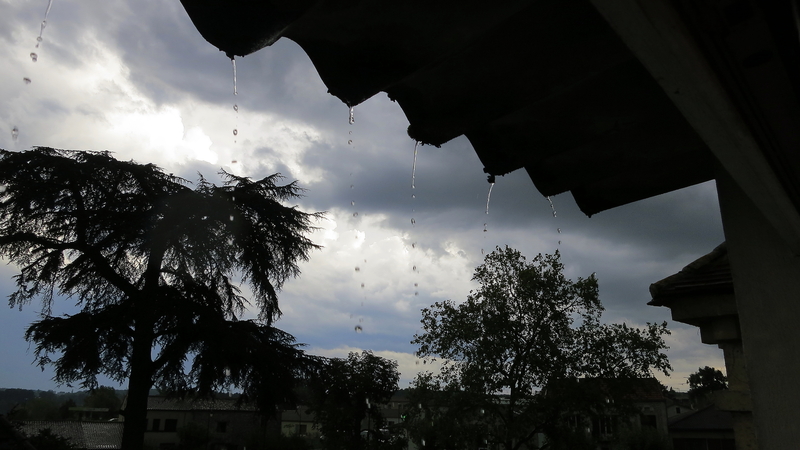 Although it was to return with a vengeance in the late afternoon, the rain desisted after lunch. This was fortunate because, having fed on a four egg, onion and tomato omelette that looked more like a heap of colourful building rubble which would have graced the Tate Modern, supplemented by a slice of Carrefour pizza, I had a bit of a clean up. Beginning by washing the filthy mop which I could then stick out of the kitchen window to dry, I made the ground floor habitable. 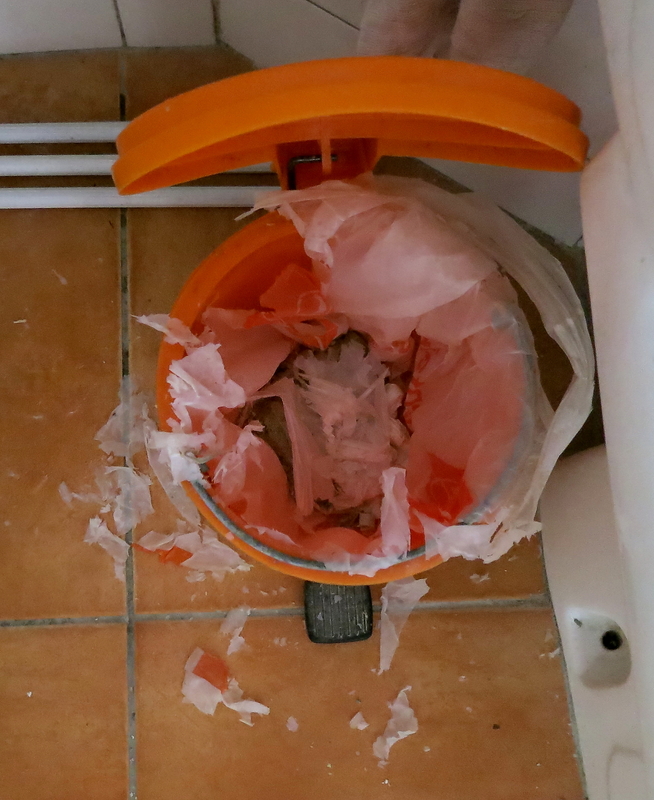 The task was hampered somewhat by the need to search for the dustpan which I eventually found protruding from a bucket of dirty water in the attic. As I sit outside the bar entering this post, I am grateful to my friends who manage it for leaving the awning up. I simply hear the spattering of the deluge, and the cracking of falling conkers on the canvas above me. Given that Fred knows this is what I do on a Sunday to make use of the Wifi, I wondered whether he had left the shelter up for my benefit. I had my first extended conversation with the local roadsweeper this morning. It was mostly about the weather, but that still counts. 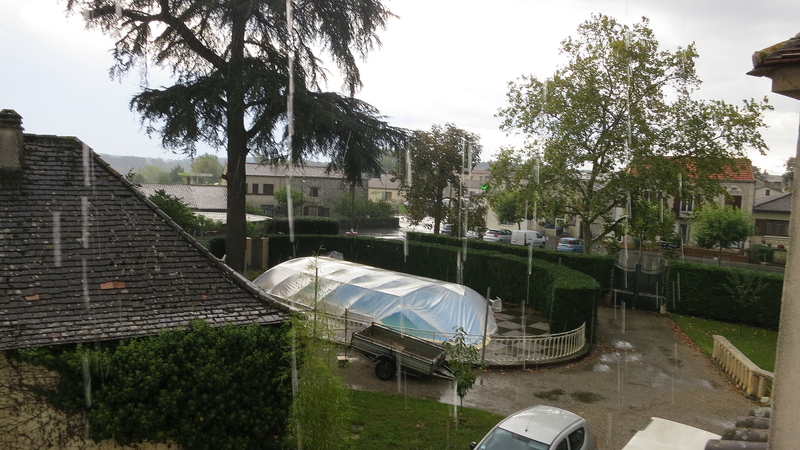 We are to have rain, which had already begun, on and off over the weekend. But it is needed for the fields. This was more successful than my attempted contribution to the discussion in the Post Office about a young lad who had just skidded off his scooter outside. Like the boy, my words fell on stony ground. He got up unscathed. I departed in disarray. 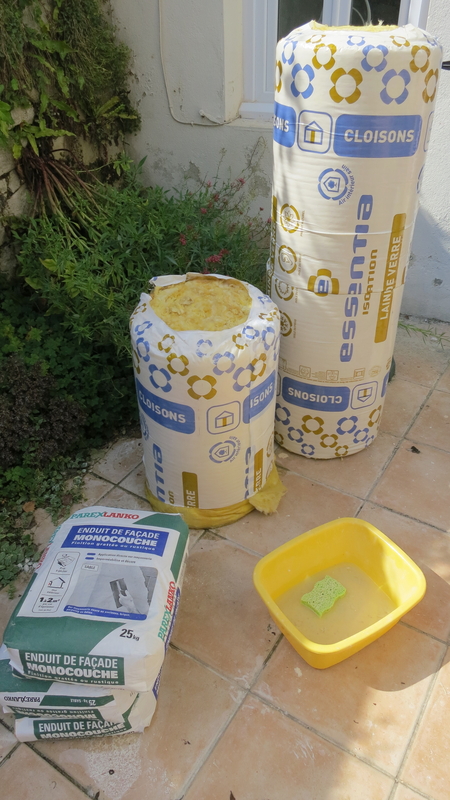 The delivery of loft insulation materials did not happen yesterday ‘because the driver is on holiday’. It is now arranged for next Wednesday, the day before I leave. Preparatory work will continue on Monday. In the rain, I walked along the Pomport Road and up the route around the field I still call the donkey’s. 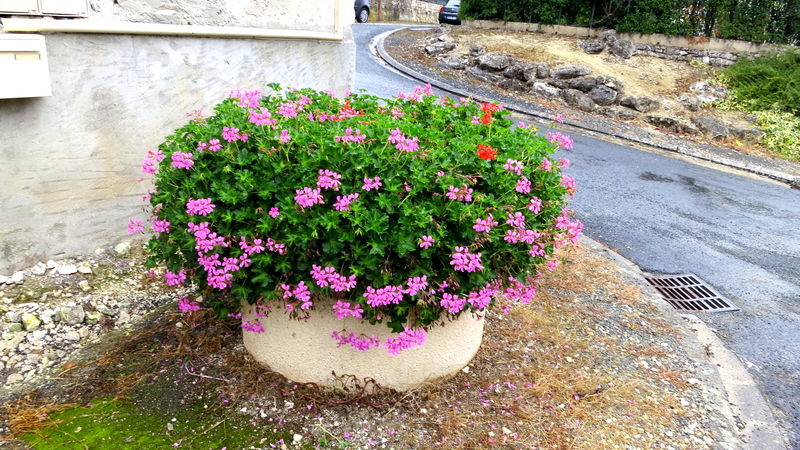 At most corner junctions in Sigoules there are bright floral displays which brightened up the grey atmosphere. 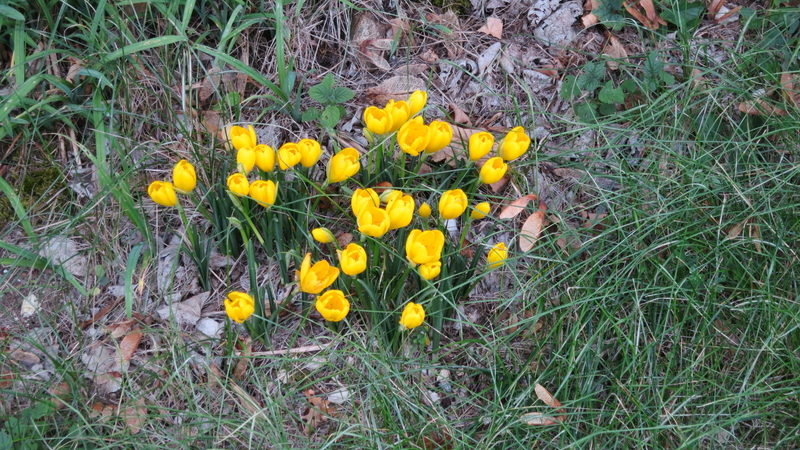 Yellow crocuses burst forth in clumps in the gardens and along the grassy banks by the side of the road. Some months ago I watched roofers working on what I take to be a barn conversion. Their work now forms an attractive patchwork quilt. My assinine friend has not been in residence for some time now, and at first I thought the field empty. Two goats, however, still occupied the top corner. 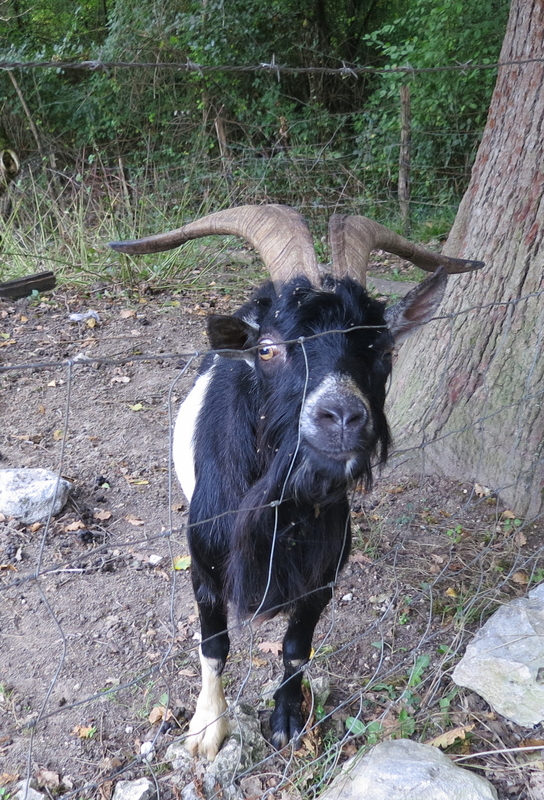 One hung its head, but the other clambered from beneath the tree that had sheltered the donkey back in April, stuck its nose through the wire fence, and gave me a beguiling bearded smile. Le Code Bar, post-summer, is now closed on Sundays, and not serving food on Saturdays. Today being Saturday I was saved disappointment by Fred, who, although in sole charge of the bar, vanished into the kitchen and produced roast duck, chips, and salad. He needn’t have worried that the duck might be too dry. 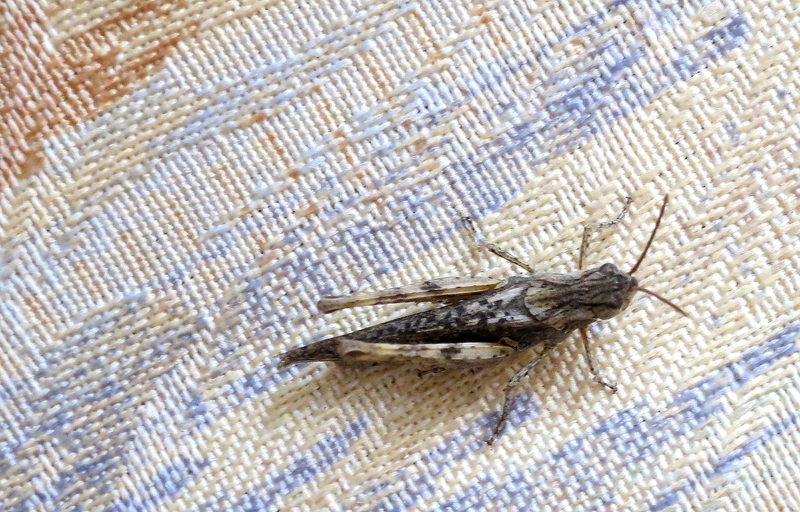 Seeking shade yesterday afternoon, a cleverly camouflaged cricket clung to the sitting room curtain draped over a table. Becoming curious, it turned to face the camera. Based on Victor Hugo’s great novel, Bille August’s film of Les Miserables is a splendid 1998 version of the tale probably best known for the long-running musical production. But then no screened story starring Liam Neeson, Geoffrey Rush, Uma Thurman, and Claire Danes could be a flop. Neeson is his usual brooding, colossal self; Rush a suitably sinister, cynical, Javert; Thurman a convincing Fantine; and Danes a delectable Cosette. It was good to see Peter Vaughan in a cameo role when I enjoyed watching it yesterday evening. This morning I walked to within sight of the Dutchman’s house in Ste Innocence, turned, and retraced my steps in order not to be late for the usual excellent Le Code Bar lunch. I sought a mobile phone signal since I haven’t received one for more than a day. High on a hill not far from Pertus, I found one and was able to call Jackie to let her know I was still alive. It was far in the distance on the road that runs through this hamlet that I was drawn by a rich golden glow lit up by the sunshine. 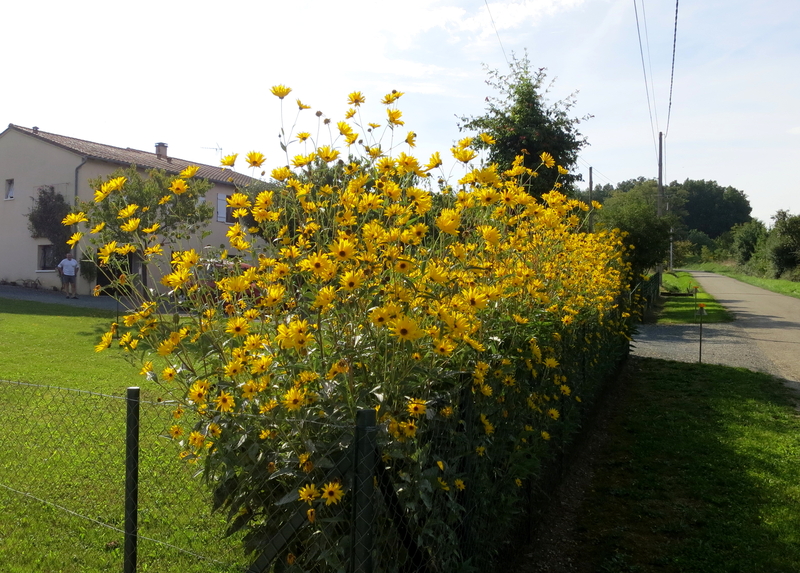 As I neared it I realised it was a hedge of blooming rudbeckia. 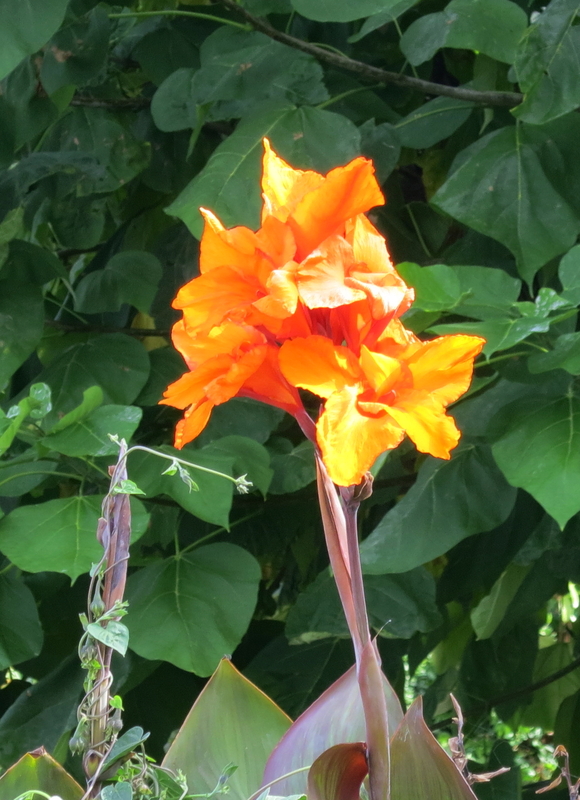 A garden on the outskirts of Sigoules sported some fine Canna lilies. 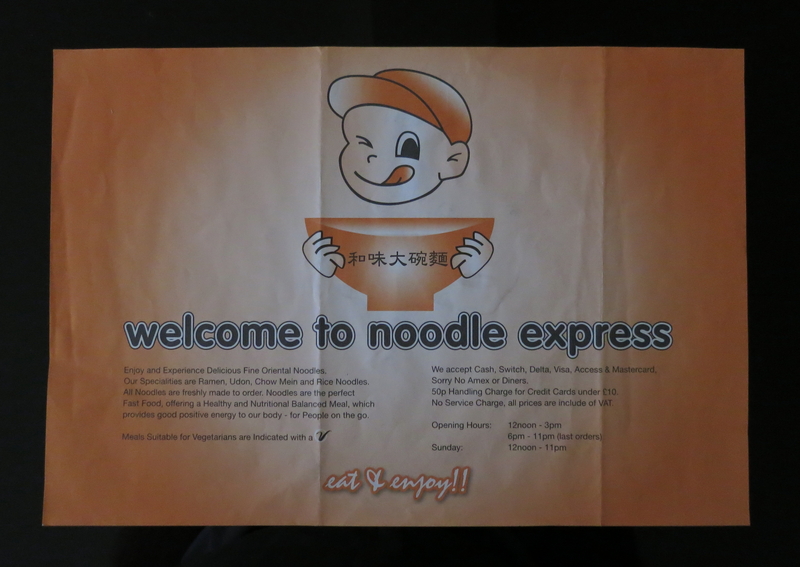 We began with a noodle and cheese soup so well flavoured with garlic that, had it been pictured in the Dandy and Beano comics of my childhood, would have had wavy lines radiating above it. Although not quite cow pie, the enormous steak and chips that was the main course would probably have satisfied Desperate Dan. I was honour bound to finish the chips, otherwise it would have been such a disappointment to Max, but it was touch and go. 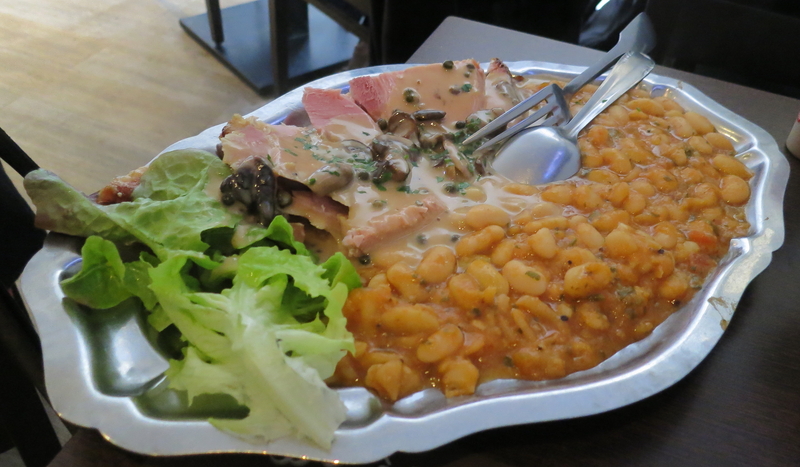 As I walked down rue St Jacques from the bar, a strong caustic smell beset my nostrils. Approaching No 6 I saw that the cellar street door was open. The Renov Conseil 24 team had, wearing masks, entered the cellar and applied liberal quatities of Javel, a powerful cleanser, to the contents. I was masked up and Saufiene, once we had both bent double to get in, gave me a tour. Apart from these nether regions not having been opened for about eighteen months, the pump renewed after the flood does not appear to be working. 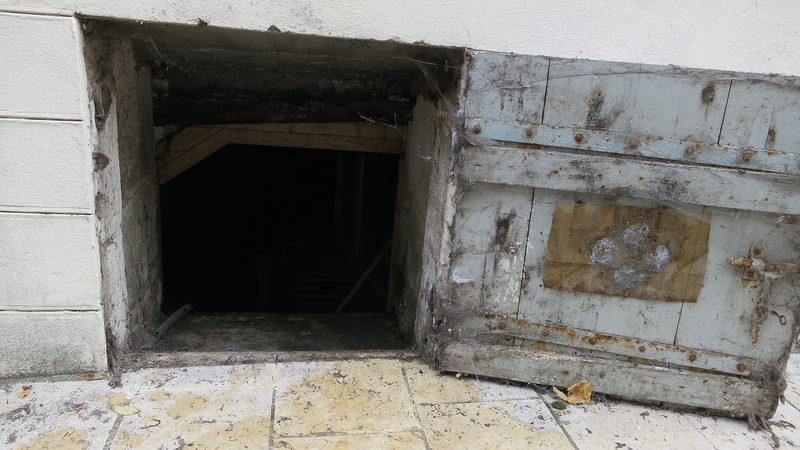 Because the street entry has to remain at least half open for airing, in order to prevent unauthorised ingress Benoit applied enough heavy bags to the trapdoor to ensure that no-one, except perhaps Liam Neeson in yesterday’s role as Jean Valjean, or maybe Ron Crabbe, to raise it from beneath. Ron Crabbe was Dad’s young removal colleague and friend of fifty years ago, of phenomenal strength, whose renowned feat was to crawl under a piano and lift it unaided. Dad and I could shift one between us, not always, as reported on 29th August last year, with total success, but Ron’s prize turn was off the scale. Yesterday evening I watched a DVD of The Interpreter, Sydney Pollack’s gripping, tender, sensitive, and spell-binding thriller starring Nicole Kidman and Sean Penn. The two principal characters are played magnificently by two of the best modern thespians. I use ‘thespians’ because the word has no gender. (I don’t know what Ms Kidman would prefer to be termed, but Sheila Hancock has asserted that she is an actress and proud of it.) The protagonists are depicted in much greater depth than often in the genre, and these two have the range to do it justice. I won’t reveal the story for anyone who may wish to watch the film. Suffice it to say that it hinges on Kidman, as a UN interpreter, overhearing an assassination plot and Penn’s efforts to prevent it. For my money the male lead is one of the greats. The credits tell us the production was made ‘with the help of ‘The Interpreter’ by Suzanne Glass. 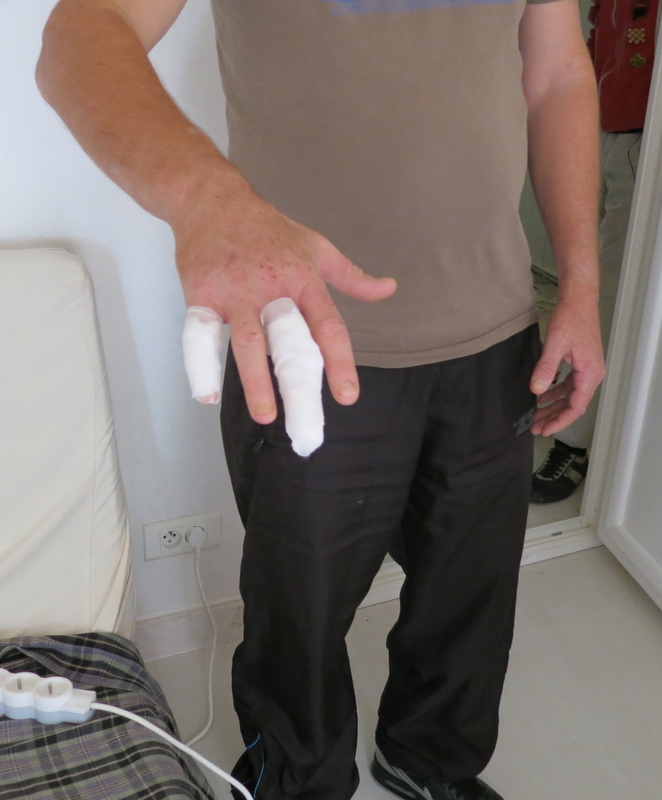 When the team arrived this morning, Benoit had two fingers heavily bandaged. In response to my question, he uncomplainingly showed me small blisters on others and explained that he had earned them grappling with the bathroom piping. This man had removed the side panel and worked at arms’ length underneath the plug hole. I said I just had to photograph ‘the fingers of the hero’. 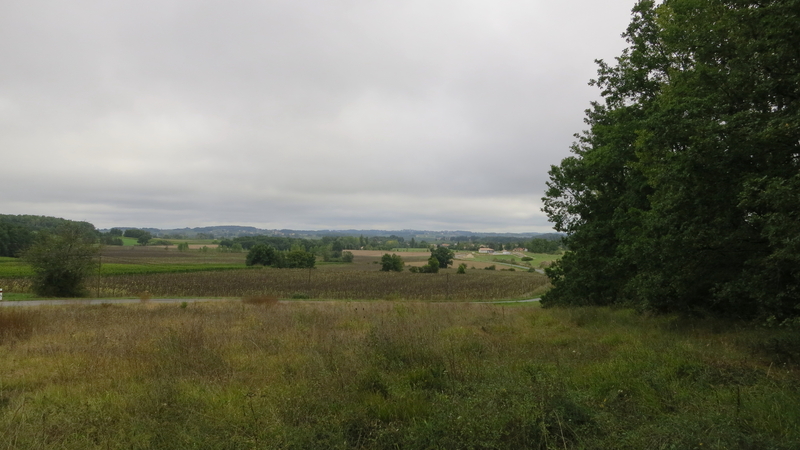 After the arrival of Renov Conseil 24 (the name of the company), I walked the La Briaude loop. 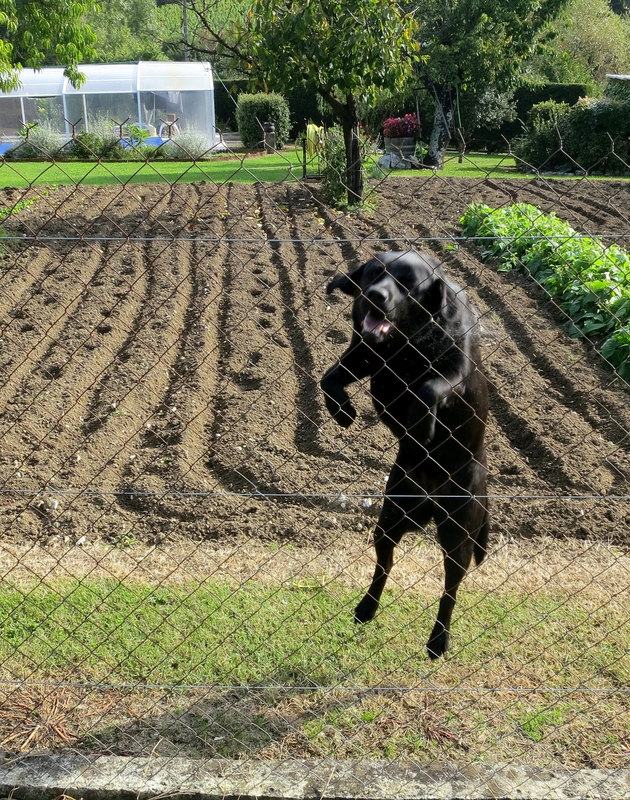 A panting, but otherwise silent, black labrador expended its energy attempting to clear its fence for a cuddle. It has always tracked me along the fence, but has seldom displayed such eager amorousness. 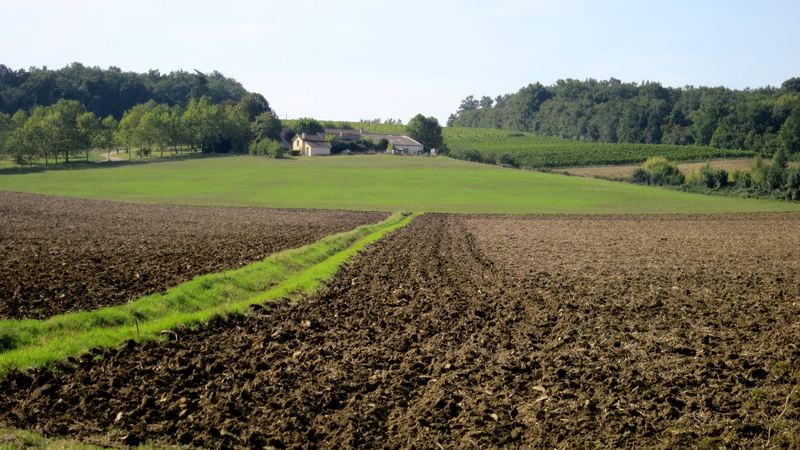 A field was being ploughed. Along many of the verges, escapee cornflowers from this and others cropped up everywhere. Except ou tside the house of the gardener I had seen on 17th May. 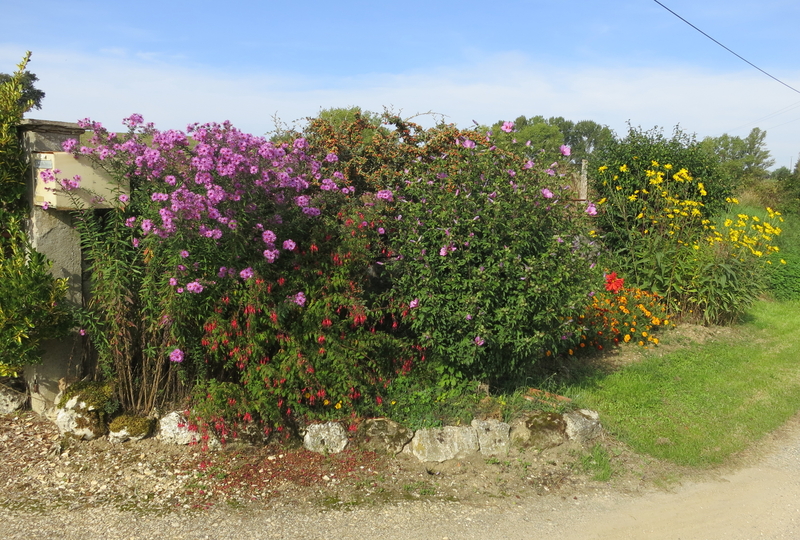 He has beautified the roadside with a fine array of flowers. 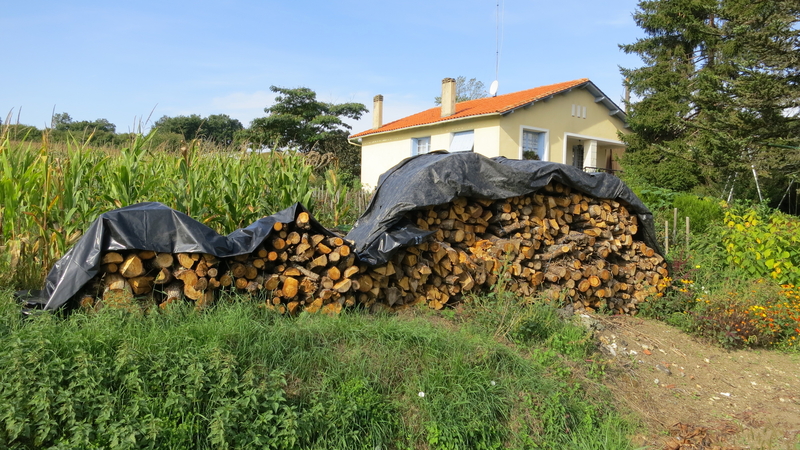 On his own land he has stacked up logs for the winter. An unseen goat bleated in the distance. 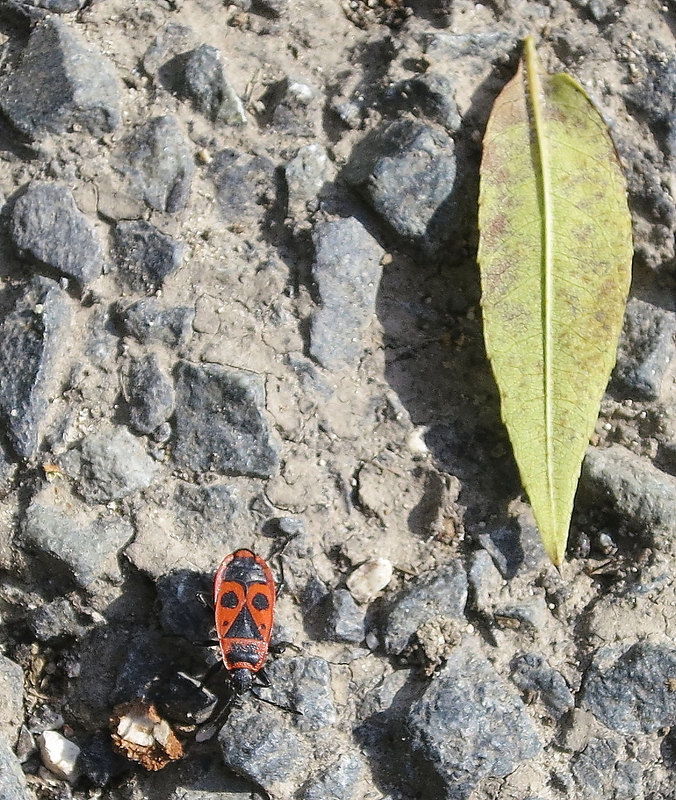 Closer to foot an African masked beetle evaded my steps. Lunch at Le Code Bar consisted of a splendid soup containing vegetables, beans, and noodles; a crisp cheese and bacon quiche; a luscious layered lasagna; and a tempting pear tart with chocolate sauce. As I finished Benoit and Sandra came in for a drink and told me that all the joints under the bath had needed replacing. Fortunately there were no more blisters. Benoit bought me a coffee. My normal journey to a sweltering Sigoules this morning began rather earlier than it should, which meant poor Jackie was forced to rise from sleep before she would have liked. This was because I was unable to check in on line. Flybe’s representative had told me yesterday afternoon that Southampton airport had ‘taken over prematurely’. He, too, was unable to process me, so, like everyone else, I had to join a queue. Dana, Sandrine’s husband, was my chauffeur from Bergerac to Sigoules. 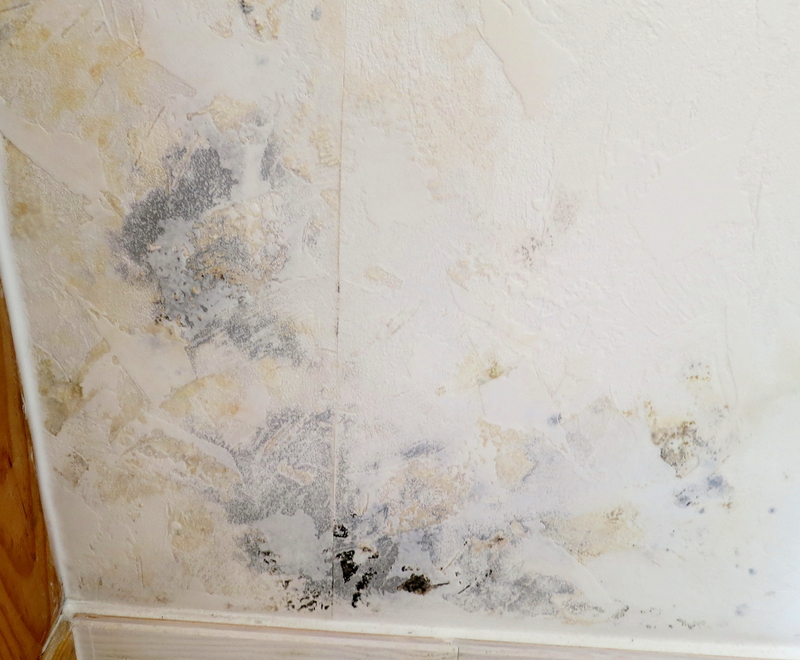 It was a good thing that Saufiene had phoned me yesterday, because the firmly shut up house had suffered from a hot and humid summer which still persists. The lack of outside air has wreaked its havoc. Necessary work is under way. Otherwise it would have been something of a shock. 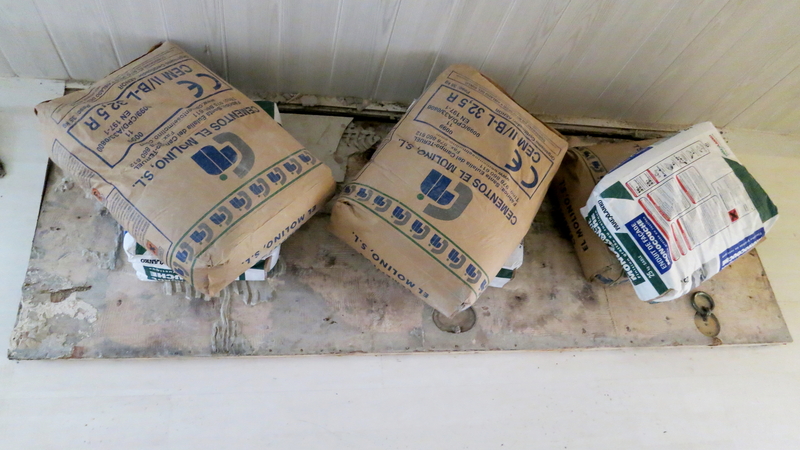 The insulation applied earlier in the year has held, but more is required, especially in the attic which needs insulating. The back hall on the ground floor, and the chimney breasts in the sitting room have been affected the most. The bedrooms, kitchen, and front hall are clean and dry. 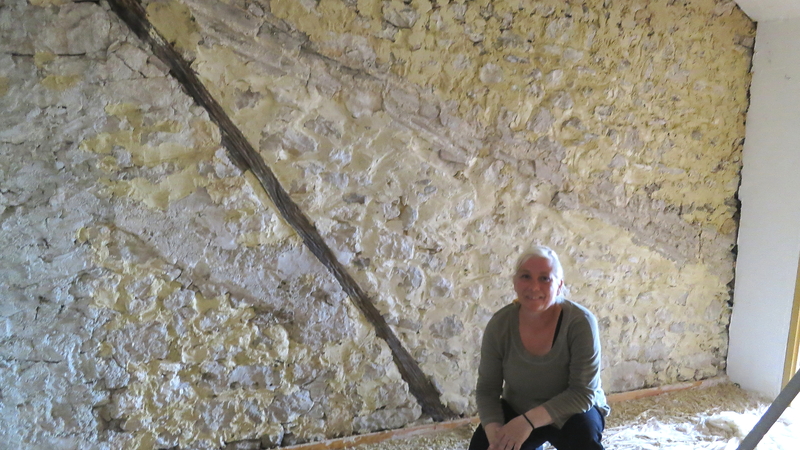 Toxic fumes from black mould and fungus have been trapped in the cellar, necessitating the wearing of a protective mask for entry. 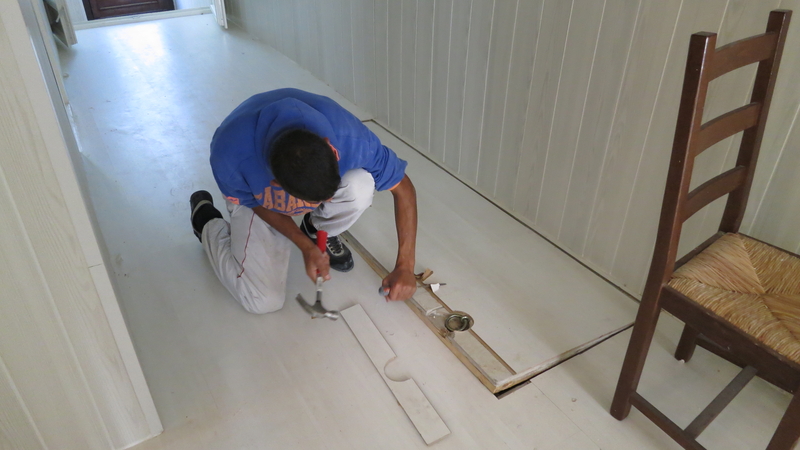 A lighter trapdoor is being manufactured, and Saufiene, with the required protection, will examine it further tomorrow. 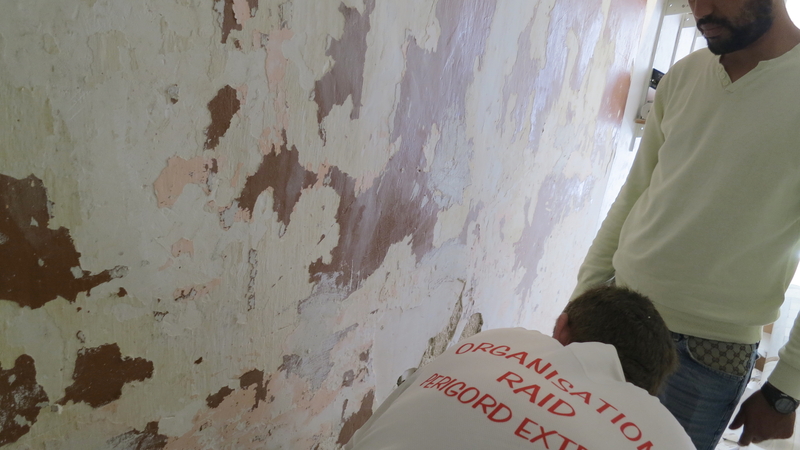 The new company’s expanded team are doing the work because Thierry has to be at the bedside, 300 km away, of his 98 year old hospitalised mother. He and Geoffrey sent their regards. Sandra is well equipped to decorate the attic. As the workers were about to leave, they discovered that the bath outlet was blocked. They applied a solution to deal with that, but a perished joint needs changing. Tomorrow. The irritating beeping of a smoke detector signalled that a replacement battery was in order. I replaced it. The device still beeped. The new battery must have been exhausted. I know I was when I made a second trip to Carrefour for one that wasn’t. There I discovered an obsolete English shilling and a still current East Caribbean 25 cent piece in the change I swear I was given there earlier. I dined on a muesli starter followed by a ham and tomato baguette, before repairing to Le Code Bar for a warm welcome and a cold Stella. Today was possibly even warmer than yesterday, although the sun did not fully penetrate the heavy cloud cover which I described, according to Jackie with more than a touch of hyperbole. I have no idea what she meant. Wearing a jacket to walk down to the village shop, and return via the footpath leading to Home Farm Cottage and Seamans Lane, was definitely surplus to requirements. 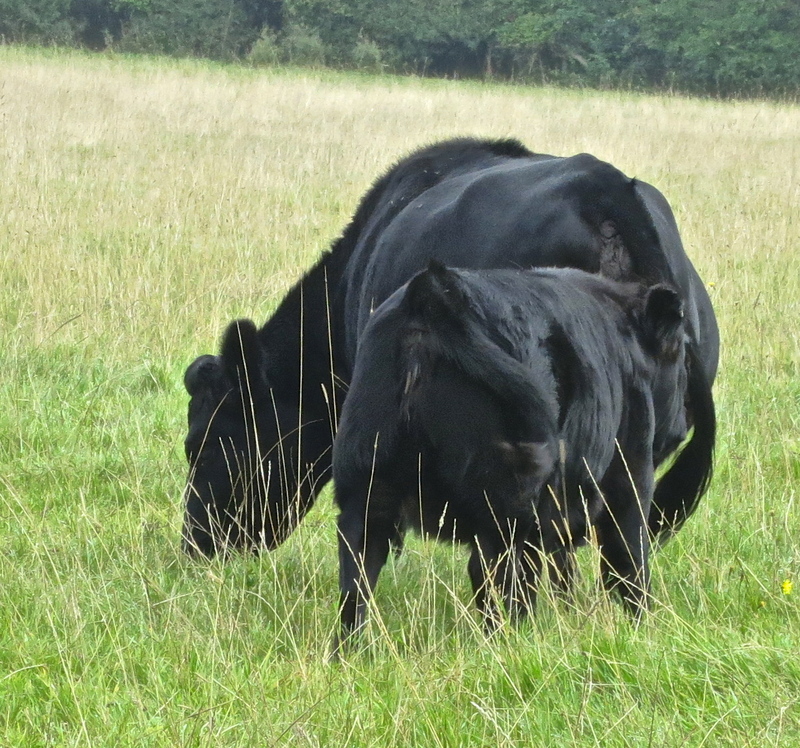 A one child family of black cattle grazed in a field on the way down. Tails were whisking away with irritated regularity. Since the calf was sticking like a limpet to its mother’s backside, I wasn’t sure whether her twitching appendage was for the benefit of the flies crawling all over her, or wafting in an attempt to dislodge her anxious offspring. Possibly the result of seasonal atmospheric affects, any piles of pony droppings that have been in situ for a while are coated with a grey fur, so that from a distance they look like a child’s cuddly toy. We are betwixt summer and autumn. 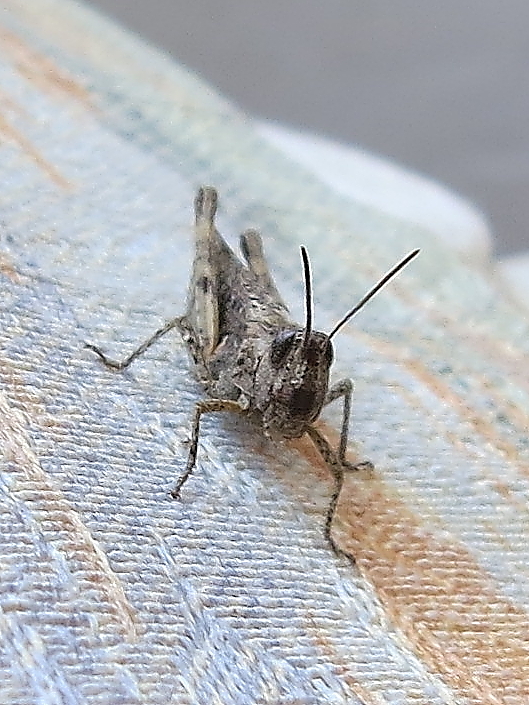 Possibly for that reason, the plant destroyers are gradually approaching nearer the house. 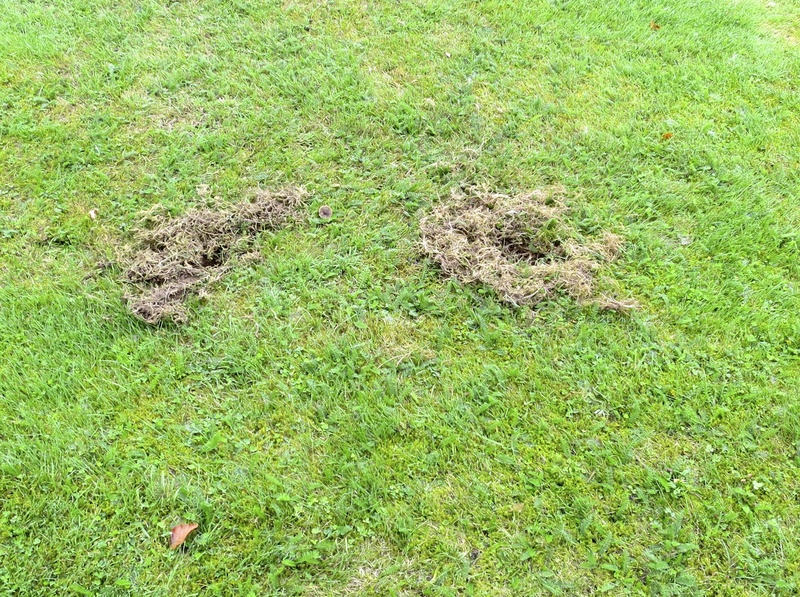 Rabbits are beginning to tear up the lawn in earnest. There must now be a community to rival that described by Richard Adams in Watership Down. His description of the small animals’ terror of the motor car, as they became transfixed by headlights, must have been very accurate. Our rabbits seem to have no such fear of John’s lawn mower. Perhaps he should work at night with the aid of a miner’s lamp. According to Mo, their damage is cyclical. They fill the lawn with holes they are emptying. The managing agents organise a cull. The lawn is undisturbed for a year or two. The rabbits come again. The rabbits are culled. And so on, no doubt, ad finitum. Before the rabbits, according to John, came the moles, whose hills he had to clear up before he could do anything else. I have described before how at least one deer is becoming less timid. Today, as I entered Lower Drive, one, possibly the very same, startled, leapt across my path, almost making me jump. When I volunteered to contribute to the meal this evening Jackie, feigning panic, held up her left hand, arm outstretched, and said: ‘No. It’s all right. I’m too tired for you to cook’. Perusal of my post of the 18th should explain her reaction. Unaided, and therefore unhindered, and pandering to my penchant for alliteration, she produced a succulent chicken Kiev, crisp croquette potatoes, carrots and cauliflower accompanied by a ratatouille that Remy would have been proud of. This was followed by a luscious toffee bomb from Lidl, for which Jackie made some custard because I am going to France for a week tomorrow and ‘will have to make do with creme Anglaise’. I drank a couple of glasses from Sainsbury’s House Red box.